Thunderstorms form when an air mass becomes so unstable that it overturns (convects) violently. "Unstable" means that the air in the lowest layers is unusually warm and humid, or that the upper layers are unusually cool, or oftentimes, both. Pockets of rising near-surface air in an unstable air mass expand and cool, and as some of the water vapor present condenses into a cloud it releases heat, which then makes the air parcel even warmer, forcing it to rise still higher in the atmosphere. If the lower level air is sufficiently warm and humid, and the higher altitude air is sufficiently cool, this process continues until a tall convective cloud -- the thunderstorm -- is formed. 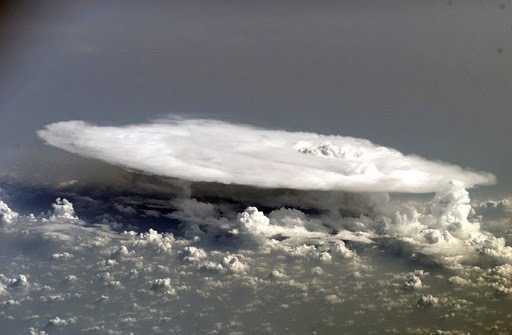 The result can be a storm extending as high as 40,000 to 60,000 feet (8 to 12 miles). The upper portions of the storm -- even in the warm tropics -- are made of ice: ice crystals, graupel, snow, and sometimes hail. About 50% of the rain reaching the surface in a thunderstorm originated as ice in the upper reaches of the storm. The updrafts in thunderstorms can be very strong -- 50 knots or more -- which can help support the weight of hailstones as they grow. Such updrafts cause extreme turbulence for aircraft, which will only fly through the strongest portions of thunderstorms if the pilots have no other choice. Despite the large stresses this puts on planes (and their passengers), modern jet aircraft are designed to withstand those stresses. 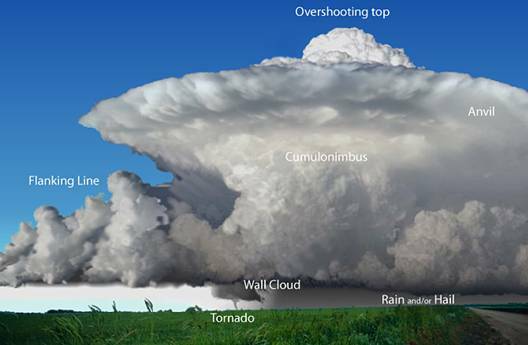 Thunderstorms are most common in the afternoon over land, when daytime heating of the land by the sun causes the lower part of the troposphere to become unstable from higher temperatures and more water vapor in the air. Or, some thunderstorms can form as result of the upper atmosphere becoming unusually cool, due to the approach of an upper air disturbance. In this case storms can form at any time of day, even when there hasn't been daytime heating of the lower atmosphere over land. There must be sufficient water vapor in order for the storm to form, since cloud and precipitation originates as water vapor. This is the fuel for the thunderstorm. As the storm uses this fuel, it is converted to rainfall. Eventually, the storm stabilizes the atmosphere by using up the excess water vapor and cooling the lower atmosphere, and warming the upper atmosphere. Technically, lightning must be produced in order for the resulting cloud system to be called a thunderstorm. A discussion of what causes lightning can be found here. NATURE'S AWESOME POWER It is estimated that there are around 44,000 thunderstorms that occur around the Earth every day. The average thunderstorm releases the energy equivalent of a 20 kiloton nuclear weapon, or a small nuclear power plant.